ANNISTON, Ala. (Oct. 21, 2014) The upgraded D6528 Mixer/Pump from Blastcrete Equipment Company gives gypsum flooring contractors a versatile and easy-to-use mixer/pump with high capacity and low maintenance. 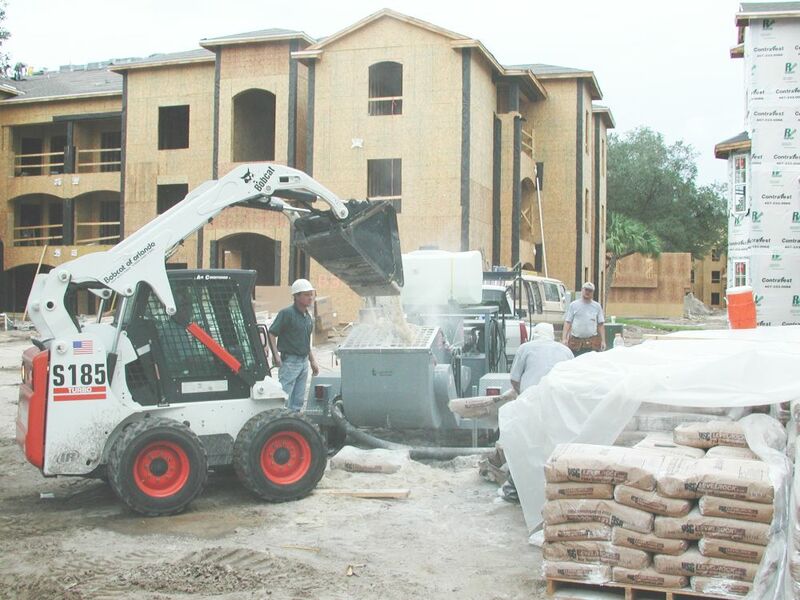 Contractors can use the D6528 Mixer/Pump to install gypsum underlayments for sound and fire proofing floors, as well as up to 1/2-inch aggregate concrete mixes for breezeways and patios. This eliminates the need for additional concrete pumping equipment, which saves space on jobsites and gives contractors greater and faster return on investment. The D6528 Mixer/Pump’s hydraulic mixer blends up to 9 cubic feet of material in just 45 seconds and keeps it in suspension as the machine dumps material into the unit’s 12-cubic-foot hopper with hydraulic agitation. Operators can use a skid steer loader and Blastcrete’s optional calibrated bucket to load as much as 7.6 cubic feet of material into the mixer at a time. This allows for precise loading directly into the mixer and reduces the amount of spillage. Blastcrete designed the D6528 Mixer/Pump’s exclusive squeeze pump with 33 percent fewer wear parts for reduced maintenance. The pump operates with as much as 450 psi for consistent installations of up to 12 cubic yards of material per hour. The unit can be used with a 1-1/2-inch hose for gypsum pours or a 2-1/2-inch hose for effectively pumping material great distances with little back pressure. “We have been very impressed with what we can do with the unit,” said Dewayne Olsen, owner of Western Slope Gypsum in Rifle, Colorado. “We can pump gypsum up to five stories high and as far as 400 feet horizontally.” Olsen added that the pump on the D6528 Mixer/Pump also stays cleaner than rotor stators on competitive equipment he’s used in the past and, as a result, parts have lasted longer. The D6528 Mixer/Pump’s squeeze pump features a 3-inch rubber pumping tube mounted inside the unit’s circular housing, where the roller section rotates and effectively pumps material through the tube. If a blockage does occur, operators can simply run the pump in reverse to relieve pressure and reduce the risk of injury that can occur if they were to open the line under pressure. In addition, as opposed to competitive rotor stator units, the D6528 Mixer/Pump’s squeeze pump does not require lubrication to keep it cool and is not damaged if the hopper runs dry. Blastcrete builds the D6528 Mixer/Pump for durability and longevity in the most demanding conditions. It features high-quality, heavy-duty, tubular steel frames that reduce noise, vibrations and the risk of cracks that can occur with channel frames. If contractors need replacement parts, they are generally less hassle to install and more economical than rotor stator units. For example, the unit’s 3-inch rubber pumping tube is easily accessible and nearly half the cost of rotors and stators. Cleaning the pump also is simple. Operators can run a sponge ball through the pump and delivery system to ensure material is completely removed. This is more effective than simply flushing with water, as rotor stator manufacturers recommend. The D6528 Mixer/Pump comes equipped with a 29-horsepower, water-cooled diesel engine or an optional 40-horsepower Kohler gasoline engine. Blastcrete designed the unit with the engine placed away from the mixer and receiving hopper to prevent thermal transfer than can cause material to set prematurely. Finally, Blastcrete offers free factory training at its facility, where operators can learn correct operation and maintenance, along with best practices for successful installations.